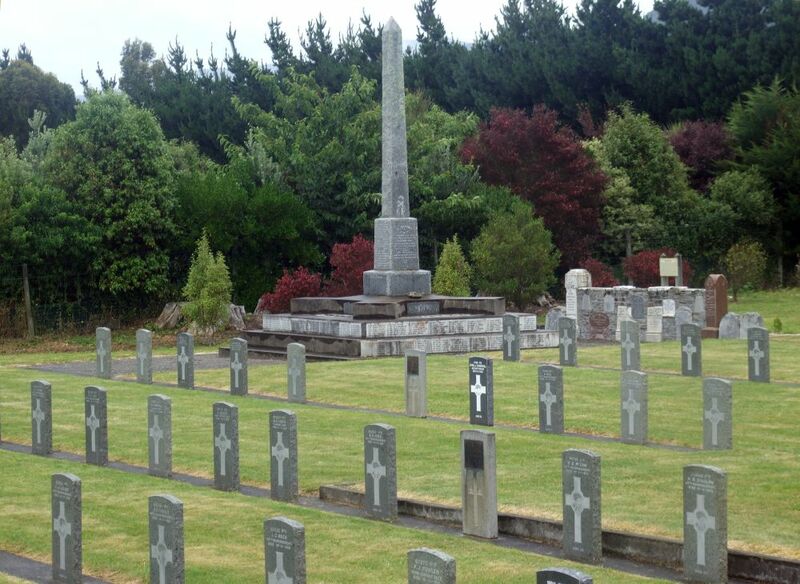 The obelisk at Featherston cemetery, surrounded by World War One headstones. About 20 soldiers had been interred by October 1918. The influenza epidemic added greatly to the cemetery’s soldier inhabitants – over 160 in November and early December 1918. Most were trainees but there was a nursing sister and other members of the medical and permament staff among the dead. There are now 182 military graves from World War One, in rows near the obelisk with names also recorded on the base of the obelisk. Some damaged headstones have been incorporated into a wall nearby. Returned services graves from the Featherston area are in another section on the southern edge of the cemetery. For brief details on soldiers buried at the cemetery, check out this webpage.